Home Internet Pinoys and their love for pizza: Papa John's is now with foodpanda! Pinoys and their love for pizza: Papa John's is now with foodpanda! Ever wondered why there’s an unspoken love affair between us, Pinoys, and the round goodness that is pizza? Here at foodpanda, it is, and will remain a mystery. But it won’t hurt to dig in a bit deeper. We did a little bit of survey and asked people what they love about pizza, and here’s what they had to say. You share it with a friend, yet you get filled! A party is not complete without your favorite pizza! You ask them to slice it into 8, and you get yourself two, and BAM, you are stuffed like there’s no tomorrow, and that’s what Papa John’s is known for—big servings! Thick crust, oven-baked to perfection, with toppings so good it hurts, the signature Papa John’s pizza! They say friends share whatever they have, and in this case, a slice of pizza makes your friendship even better. Like a true friend, you can call them in the middle of the night! Aced an exam? Boyfriend issues? Or plain boredom on a typical Saturday night? You call your friend to shriek at, wail at, or just make fun of. And they don’t judge you. They will never judge you. Just like how pizza will never judge you. Hungry tummy in the wee hours of the night? Fret not, with foodpanda and Papa John’s, you can order your favorite pizza until 11 in the evening! In just 4 easy clicks, pizza will come to you with, yes, box wide open! Taking cue from Micheal Jackson, “it don’t matter if you’re black or white”! Racism is old school, and acceptance is the new thing! We all have equal rights—right to have our pizza the way we want it! Meat lovers, rejoice! Want the freshest picks from the garden, go ahead, indulge! Or craving for plain, on-point cheesy goodness? Papa John’s surely hits the spot! Their wide selection of menu, ranging from their Specialty selection, to their well-loved Classic choices, will surely make any pizza lover go loco and crazy (in a good way). Some infinities are bigger than other infinities… the possibilities are, err, infinite! Thank you, John Green, for these words of wisdom! Yes, the promise of infinite choices is a big shoe to fill in, but there are some that fits like a perfect 10! Like Papa John’s! Can’t decide what to choose from Pepperoni and Hawaiian? Then have both. Or why not do a yin yang—good balance of Garden Special for the healthy girlfriend and Texas Heat for the adventurous boyfriend? Go over the top and add your choice of toppings and put your food creativity to test. Choices—only foodpanda and Papa John’s can give! It’s the ultimate comfort food! Pizza is a way of life. When you’re happy, you celebrate with pizza. When you’re sad, you cry while you bite every slice there is. Pizza is the ultimate comfort food—it either bring back good childhood memories (your 7th birthday at your favorite pizza parlor perhaps) or gives you a good chill on the spine! A good pizza hugs you, warms your heart, and makes you feel at home. Enjoy Papa John’s, now available via foodpanda! Visit https://www.foodpanda.ph/restaurant/ct9xy to get pizza craving satisfied in an instant! Download the foodpanda app for ease of access, and more convenient way of ordering Papa John’s! And as a welcome treat, Papa John’s and foodpanda is giving every pizza lover an offer to crave for. Order from foodpanda starting March 19 until May 19 2015, and get 2 pizzas for the prize of 1—for only 488, you get to enjoy one 12” Hawaiian Pizza and one 12” Pepperoni Pizza. Want something sweet and savory? 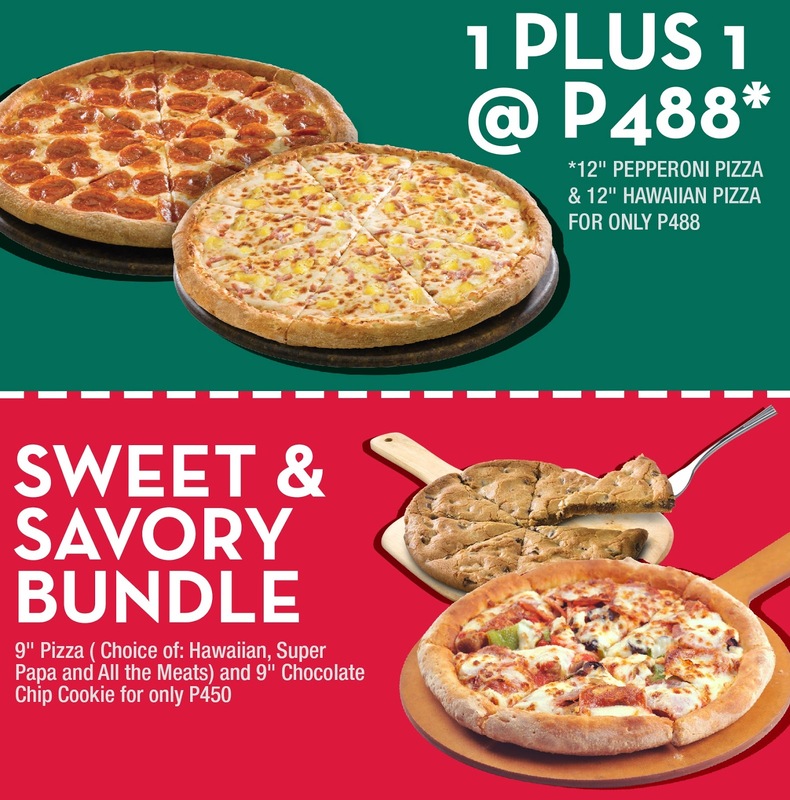 For 450 pesos, get a 9” pizza (choose from Hawaiian, Super Papa, and All The Meats) and a 9” chocolate chip cookie! Offer is only valid when order is placed via foodpanda, and is available to satisfy your cravings from March 19 to May 19 2015!